Click the image to see a gallery of all the images. 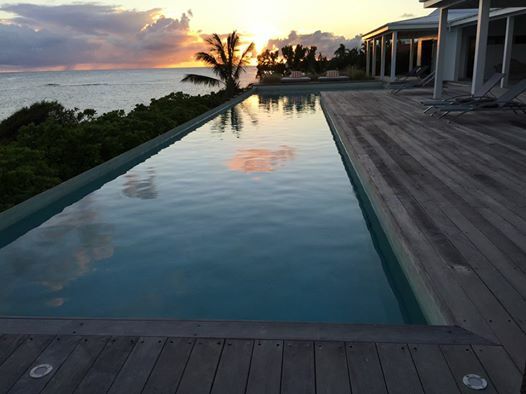 We just returned from a week's stay in a lovely villa on Anguilla. It is Shutters on the Beach, part of Villas of Distinction. I think the highlight of the villa is the pool. Everyone (5 of us) consolidated our pictures and by far there are more shots of the pool and blue Caribbean from our deck than anything else. The place is huge. Double seating living room and open dining room. 2 bedrooms in main structure and 2 more across the courtyard. Plus 2 more bedrooms on a lower level. We had the kitchen stocked and only minor hitches in the translations. Anguilla has some fabulous restaurants, from very refined to fun beach bars. We enjoyed Tasty's, Mangoes, Da Vita along with Ernie's and Elvis Beach Bar. For other meals we cooked in. There is a gas grill and full kitchen with gas stovetop. It came with daily maid service, concierge, and house manager. "Luxury Traveler"
Find inspiration for your next travel experience. Voted Best Travel Agency in Naples! Family vacations; to go or not to go? SILVERSEA NEW ALL-INCLUSIVE PACKAGE FOR 2016 ASIA CRUISES! Concierge Travel Agency in Naples! Copyright ©2019 Jen Mitchell Travel, LLC. All Rights Reserved.